A strawberry old fashioned with a sweet and sour taste. 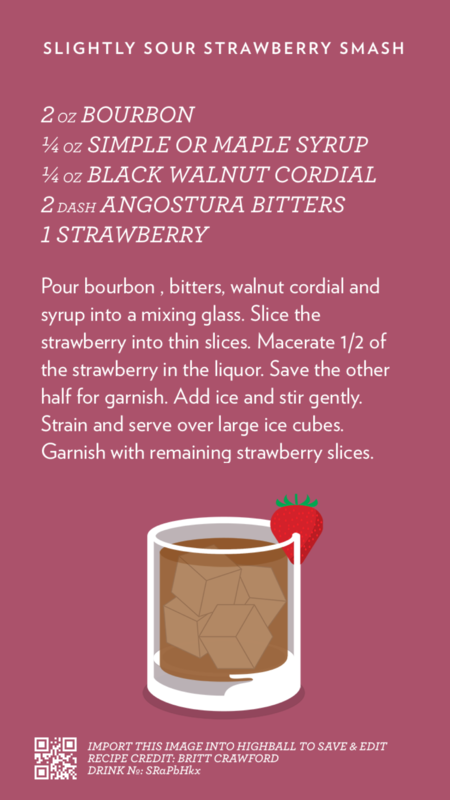 The walnut cordial is somewhat sour and balances the sweetness and fruitiness of the strawberry much like balsamic vinegar in a strawberry salad. Sounds weird. Tastes great. Right click and save the image to import into Highball. Pour the bourbon, bitters, walnut cordial, and syrup into a mixing glass. Slice the strawberry into thin slices. Macerate half of the strawberry in the liquor. Save the rest for a garnish. Add ice and stir gently. Strain and serve in a tumbler with a large ice cube. Garnish with the remaining strawberry.